Anyone who has been to the Hudson Valley can attest to its beauty. In addition to the scenic landscape there are some amazing historical spots that visitors can see today. A historical homes tour is our topic for today but let’s back up just a bit. Did you know that the Englishman who found it stumbled upon it by accident? In 1609 Henry Hudson was simply looking for a passageway to China as he was sailing along the north Atlantic coast. He and his crew entered their ship through the New York Bay and traveled 150 miles up the river before realizing it was not a path they were hoping for. The river is named after him and his explorations were responsible for bringing the first Dutch people over to settle the area. Fast forward several years and you have families such as the Vanderbilts and the Rockefellers building estates and manors in the area. While many of these stately families went on to build luxurious mansions, their original historic homes still stand and have been preserved. 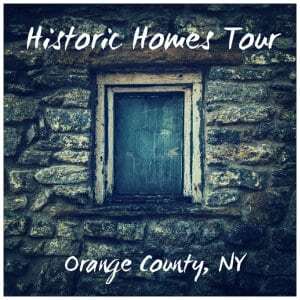 There are several right here in our own Orange County and a leisurely driving tour of these historic homes would be a great way to spend a day during your stay with us. Hasbrouck House at Washington’s Headquarters – Located in Newburgh, NY, this historic home dates back to the Revolutionary War as it served as headquarters for George Washington. There is a museum here with an impressive collection of artifacts and the home shows how George and Martha would have lived during those years. Crawford House – Also in Newburgh, this historic home dates back to 1830. Labeled as a “Green Revival” mansion, it belonged to shipping tycoon Captain David Crawford. It is not open for tours at the moment but definitely worth driving by to take a look. Gomez Mill House – Dating back to 1714, this home belonged to Luis Moses Gomez, who had fled to the Hudson Valley with his family during the Spanish Inquisition. This home is the oldest Jewish residence in the U.S.
Ellison House – Located at Knox’s Headquarters State Historic Site in New Windsor, this Georgian-style house was built in 1754. American commanders occupied the home during the Revolutionary War and during the 18th and into the 19th centuries the Ellison family shipped flour from their mill down the Hudson River to New York City and the West Indies. You can find more information and a few more homes to visit by clicking here. We encourage you to take some time to truly enjoy the Hudson Valley while you are here. This area has so much to offer and we would be happy to help you plan your next getaway. Book with us online today and contact us anytime for further information. This entry was posted in Area Attractions, History by admin. Bookmark the permalink.